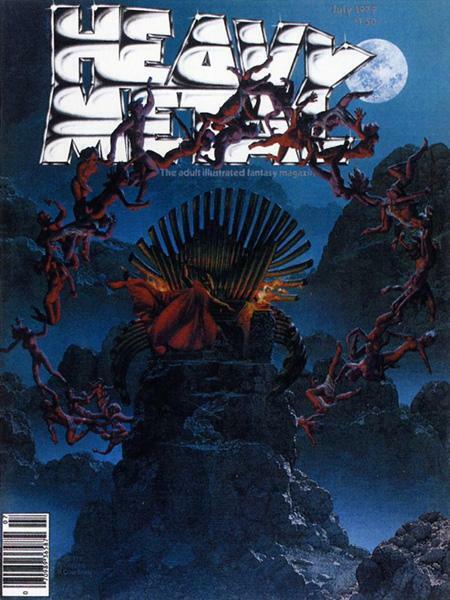 I’d like to ask you if you have any idea about who designed one of my favorite logos in comics: Heavy Metal Magazine. And also, what do you think about it? Isn’t it one of the best logos around? I agree with you, Tonio, it’s a very fine logo. Let’s take a look at several versions. At the top is the original solid version, then a double-outline version and a single-outline version, followed by a shiny metallic treatment. I like the heavy, easily readable letters, and I think the design of “HEAVY,” having it sinking into the word “METAL” below is a brilliant example of a logo that expresses what it says. This doesn’t always work, but here it’s perfect. The logo is distinctive, original, and could probably be read at a great distance, helpful on a newsstand. I might be wrong, but I always thought that the logo was designed by Peter Kleinman. I took the basic one (a solid) and did it as both single- and double-outline versions so that it could be better used with more linear artwork and in order to offer more variety for the different types of paintings that we used for cover art. Peter later somehow acquired a truly weird, overly-ornate and nearly unreadable version that was used on a cover illustrated by Corben. I toned it down a bit, but it was still way too busy. After that, I handled all the cover chores. I’m going to assume that Kleinman was the original art director or cover designer for the magazine, as I don’t have any old issues to check for his credit. I’m sure someone will tell me if that’s not right. So, the outline versions seen above were done by John. I don’t think the metallic version is the “ornate” one he is talking about, I believe that came later. It’s actually, once again, a perfect match-up of style and content, as it helps express what the logo says. I like it, though I’m sure it wouldn’t work on every cover. Good, we tracked that one down. I always enjoy finding out who created logos. Other logo studies on my LOGO LINKS page. This entry was posted in Logo Studies on July 12, 2007 by Todd. Regarding the “truly weird, overly-ornate and nearly unreadable version” used on a Corben cover, could it be this one? and it’s the only one that seems to fit that description. and much later in a bunch of consecutive issues, from March 1996 to March 1997. Your first link didn’t work for me, Tonio, but if you mean the July 1979 cover, I’d say that’s the one John was talking about. Well, nice to get confirmation, Dave, thanks.